The Amageza Racing team (known for gruelling multiday stage races like The Amageza Rally and West Coast Baja) decided to test their hand in the aviation industry, after a chance meeting with Juanita Kruger (SAGPA committee member) in 2015 at the Morningstar Airfield in Cape Town. Known for taking motorsport competitors to the lesser known corners of Southern Africa, Alexander Nel decided once more on the Northern Cape Province. 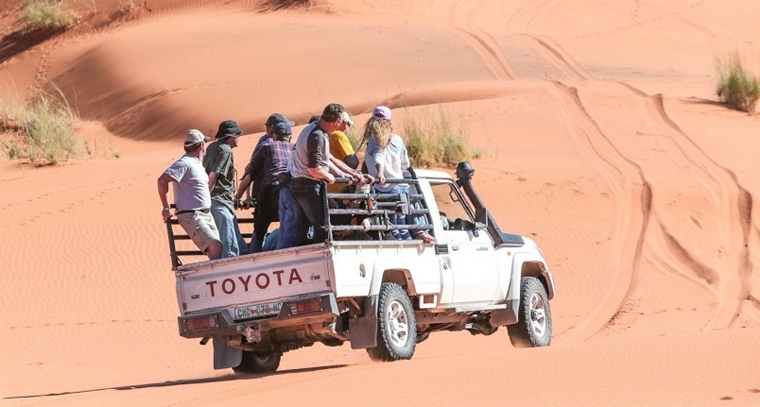 Known as the 'Extreme Province' with acres of open space and uncluttered airspace, the Northern Cape is well suited for the adventure traveller. The greater Askham area was ideally suited for this purpose, being situated on the border of Botswana. This area experienced years of severe droughts, but suddenly heavy rains had transformed the Hakskeen Pan area into a myriad of streams and lakes. With the intended landing spot at Koopan (FAAK) now under 2 meters of water, the initial date set for the end of April was moved to mid-June, and once again everyone started getting ready for some long flights to get to the pan. But come June, Sergeant Murphy always on the prowl, was not going to let us get away that easy. Three days to the Fly in, and a small gap to get out from Cape Town towards Saldanha and skirt the coast to get around the cold front that was hanging over the Western Cape the intrepid adventurers faced the cold and lined up to take-off from Morningstar Airfield in Cape Town. Two aircraft had already taken off, when, what could have been a freak gust of a crosswind, caused the third aircraft to take-off, to overturn. Fortunately the pilot and his passenger were taken away with slight injuries, while the rest sat around the clubhouse, drinking coffee and making plans. At this stage everyone had decided not to fly that day anymore. Two pilots decided to try again in two days' time, while four others decided to make it a road trip, fired up their cars, and started driving. Two days later and the very last chance to leave Cape Town to arrive in time for the start of the event. With medium to high cloud predicted, the event organizer, 'no way I'm driving' Alexander Nel and Mike Roberts took off from Morning Star heading North. And so the adventures (good and bad) unfold. Unfortunately Mike Roberts experienced a flat tyre at Augrabies and had to overnight. Low mist in the Highveld had also caused the pilots from Kitty Hawk Airfield to postpone their departure with a day. But working around the weather, the pilots trickled in at Koopan on the Thursday, with the big bulk arriving on Friday morning. A total of 32 persons, 15 gyrocopters and 1 fixed wing aircraft arrived safely, and what an awesome weekend was had. 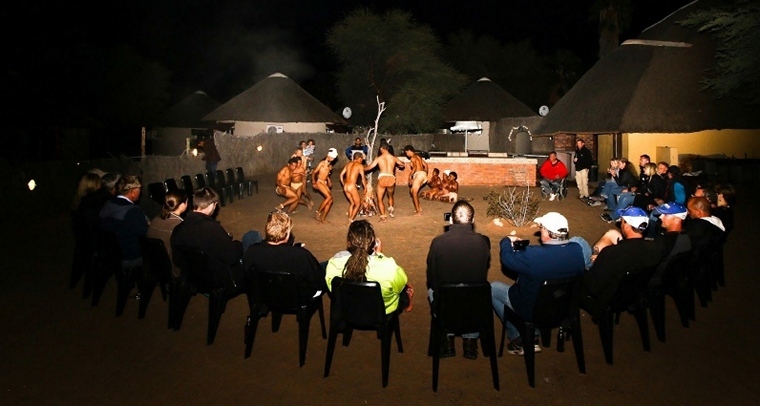 With the great food and lodging offered by the Molopo Kalahari Lodge and the minibus crewed by Sean Kriel (from Amageza Racing) the pilots, fuel, lunch and everything else were constantly shuttled to-and-fro, racking up 400km in the process! Friday afternoon saw the pilots exploring the area flying to Hakskeen Pan to explore the track where the world land speed record will be attempted. Next they headed off north-east to view game and to land on a small pan for lunch. Those who were a bit flight fatigued made themselves comfortable on Koopan and waited for Mike, who had now fixed his tyre at Augrabies, to land. After his safe arrival the pilots decided to try their hand at formation flying after a briefing by experienced pilot and gyrocopter instructor Len Klopper. With some awesome pictures taken, everyone was transported to the lodge leaving their trusty aircraft with the local San guardsman for the night. That evening stories of big trek to Koopan and the magic scenery experienced by the pilots were shared in the well stocked bar of the lodge. The next morning everyone was up early getting ready for the dune exploration day. Welcomed by Tebogo Velembo and Desty van der Merwe representing the Northern Cape Tourism Authority, today they would get to fly miles of dunes and dry lakebeds where camels still roamed freely to land at a another lake bed near Noenieput, where the owner Faffa Rossouw had arranged a couple of off-road vehicles to take everyone into the dunes for lunch. 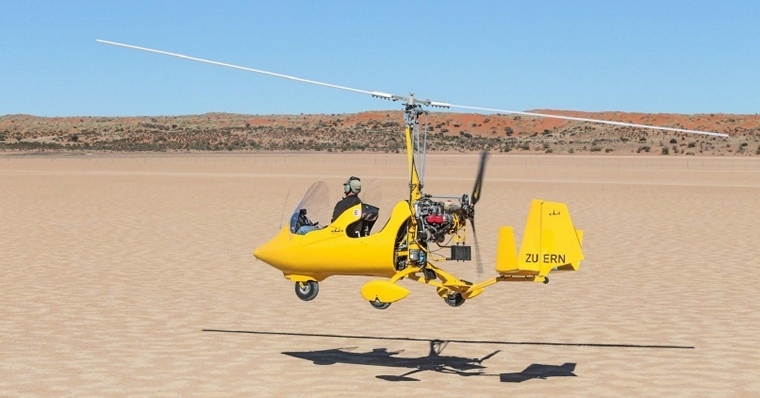 With laughs, white knuckles and nervous giggles everyone congregated on the dunes while Jacques Swiegers took a kid around the dunes in his gyrocopter. Two hours later saw everyone lined up for a mass staggered take-off on the pan, with all but two heading west to view the 5 string cattle fence marking the border with Namibia. With most aircraft now having a little more than an hour's worth of fuel left, a ragged gaggle of gyrocopters were hugging the dunes back to Koopan. The afternoon ended with a price giving by Juanita Kruger with great prizes sponsored by Comet Aviation Supplies, followed by an epic sunset on the pan. The evening was highlighted by an awesome display of authentic San firedance arranged and offered by the community. Two gutsy pilots even joined in the last dance! With many a mind now getting focused for the long trek home, pilots pledged to return once more to the sample the silence, wildness and tranquillity of the Red Dune Kalahari in the Northern Cape Province. Roll on 2017 GyroAfrica!